This is an outstanding book on the side effects of interventionism, written in extremely elegant prose and with maximal clarity. It documents how people find arguments couched in moralistic terms to intervene in complex systems they don’t understand. These interventions trigger endless chains of unintended consequences –consequences for the victims, but none for the interventionistas, allowing them to repeat the mistake again and again. 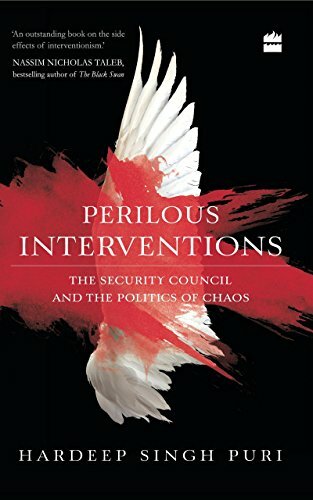 Puri, as an insider, outlines the principles and legal mechanisms, then runs through the events of the past few years since the Iraq invasion; each one of his chapters are models of concision, presenting the story of Ukraine, Syria, Lybia, and Yemen, among others, as standalone briefings to the uninitiated. It was high time that somebody in international affairs has approached the problem of “iatrogenics”, i.e. harm done by the healer. This book should be mandatory reading to every student and practitioner of foreign affairs. This was written by John. Posted on Monday, January 9, 2017, at 8:42 pm. Filed under Books. Tagged Hardeep Singh Puri, Perilous Interventions. Bookmark the permalink. Follow comments here with the RSS feed. Trackbacks are closed, but you can post a comment.